The Joby Gorillapod SLR-Zoom Flexible Mini-Tripod is a bendable mini-tripod that can handle smaller loads (typically a point and shoot with a fixed lens and/or a small flash – up to only about 1 lb or under). It is jointed so that it can be gripped to poles and can be flexed to point in just about any direction. It is ideal for travel. 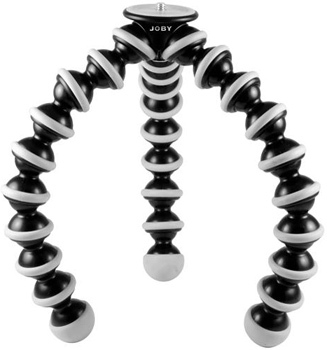 If you want this same kind of tripod but with a higher payload, see the Joby Gorillapod Heavy Duty Flexible Mini-Tripod. This tripod does not include a tripod head. It does include a 1/4"-20 mount that can connect directly to a camera or a lens' tripod collar plate. Plan accordingly.